Calling himself someone who shakes things up, and likes doing it, Gov. 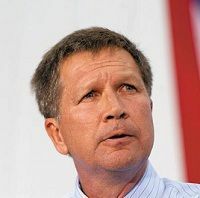 John Kasich promised a big emphasis on education policy during a speech Thursday night to the Wood County Republican Party’s Lincoln Day Dinner. 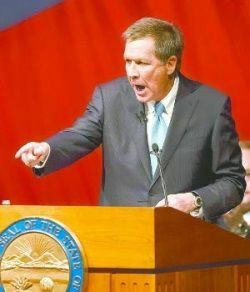 “We need significant, dramatic change in the way we do education,” Mr. Kasich said. The governor told the Bowling Green audience his plans include introducing students early to the idea of employment. “We’re starting in first grade to talk to young kids about occupations,” he said. He also vowed to restore vocational education. “We are going to push this, I don’t care what it’s going to take,” he said. I guess it is okay our “Education” Governor wants to reform the hell out of education, but involving businesses and faith-based groups isn’t the way to do it. It’s just something he says to pander to his base in Northwest Ohio which is more Red than blue. Education shouldn’t be run like a business since it isn’t producing a widget. 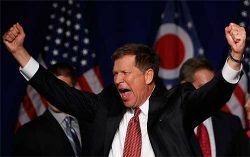 But then again Kaisch’s ideas on education reform aren’t based on reality anyway. I think he needs to leave ideas for education reforms to the experts – you know people who are educational professionals – and stop making it political.